Our glass restoration and glass protection services for architectural windows always saves a substantial amount of money when compared to glass replacement, and with less disruption to your tenants. Just about any stain or damage in the surface can be easily removed with our services. Call us for a free quote on our glass refinishing services. Our window glass restoration services in Baltimore, Maryland are just a phone call away. Many commercial buildings develop glass stains due to exposure to the elements, high amounts of tap water from sprinkler system over-spray, minerals leaching from adjacent pre-cast surfaces and inferior product used to maintain a building. 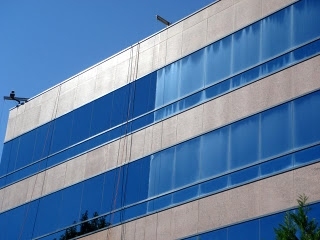 Removing mineral stains and etching from window glass in Baltimore, Maryland is our specialty. Architectural windows are subjected to severe conditions which may result in damage to the surface of the glass. This damage is unable to be removed with standard window cleaning procedures, and requires glass restoration in order to remove the glass stains and spots. Etched windows have a cloudy appearance that makes the windows look dirty from both the interior and the exterior of the building despite having your windows cleaned on a regular basis. Glass scratch removal in Baltimore, Maryland is a highly specialized service that requires qualified management and technicians, the proper products, and extensive experience. Improper products and techniques can result in severely scratched or burned, and noticeably damaged glass. Industry standard techniques often use harsh, abrasive products in an attempt to remove stains from the highly polished glass surface. This causes severe scratches in the glass. Other industry standard techniques involve the use of harsh acids that can leave burns in the glass and surrounding architectural materials creating a hazed look. Our technique completely removes stains from the glass without leaving any scratches or burns and produces a highly reflective finish. 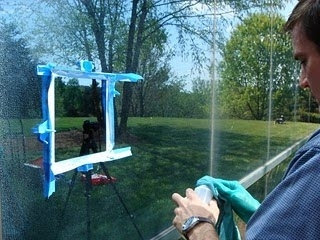 If you need glass scratch removal services in Baltimore, Maryland, just give us a call. We have effectively completed glass scratch removal services for contractors and glaziers consisting of thousands of windows per job on high rise buildings. Our glass scratch removal services were appreciated by the contractor because we were able to remove the scratches for a fraction of the cost of replacement, and we were able to complete the project faster than if the contractor were to replace the glass. Hard water stains are formed when high mineral content water comes in contact with the glass surfaces. When the water evaporates it leaves behind all the hard minerals within the water, and creates difficult to remove hard water stains on the glass surface. This can be caused by sprinkler systems, water erosion from adjacent stone surfaces such as precast and dust that blows through the air. The hard water stain is the most difficult stain to remove especially when the mineral source contains silica. The silica bonds to the surface of the glass easily since most architectural glass is comprised of about 70% silica. This stain is the most difficult to remove because the pure silica in the stain is much harder than the glass surface which the hard water stain resides on. Removing the hard water stain without completely refinishing the glass with a product such as the Glass ReSurfacer Final Polish is near impossible. If you need hard water stain removal services in Baltimore, Maryland just give us a call. We use high performance glass protective treatments and or glass protection that can be applied to architectural window glass surfaces that will help to prevent the further development of glass stains as well as glass scratching. One such product called Glass Defender MD will install a rubberized, silicone protective coating, that will last on the surface of the glass for many years to come - helping to prevent stains and scratches. When stains such as minerals come in contact with the glass surface they will reside on the protective coating instead of easily adhering to the microscopic cracks and crevices of the glass surface. As well, this rubberized coating will resist scratching much better than unprotected glass because the surface at a microscopic level is flexible. We always recommend applying a glass stain and scratch protective treatment to newly restored glass especially in Baltimore, Maryland.